Although radiation from the Fukushima Nuclear Power Plant does not threaten Russia, scientists from the country periodically monitor the waters off the Kurils, which share maritime borders with Japan. The scientific expedition vessel Professor Khlyustin, carrying Russian scientists, experts and military personnel, left the port of Vladivostok in Russia’s Far East on September 25 and headed east toward the Kuril Islands of Urup and Simushir, where they were due to take samples of soil, freshwater and silt. However, the beginning of the expedition has suffered from bad weather, which has suspended the taking of samples by the crew: "Work was done at eight out of ten stations on October 2-4. Bad weather has suspended further operations," says a report by FSUE Rosmorport, the owner of the vessel, posted on its website on Tuesday. In the space of a month, the expedition plans on crossing the Sea of Japan and sailing along the eastern shores of the Kuril Islands, a narrow chain of isles stretching 800 miles from Russia’s Kamchatka Peninsula to the Japanese island of Hokkaido. The scientists’ principal aim is to monitor radiation levels in the area affected by the accident at Japan’s Fukushima Nuclear Power Plant on March 11, 2011. This is the third expedition since the disaster. The first one took place right after the catastrophe, the second - a year later. The new expedition is being carried out under the aegis of the Russian Geographical Society and has been organized by the State Oceanographic Institute. Aboard the vessel are collaborators from state nuclear corporation Rosatom, the Ministry of Defense, the Russian Hydro-Meteorological Institute, the Rospotrebnadzor Monitoring Agency and the Nevelsky Naval University. Results from past expeditions showed that pollution was almost zero and the biggest threat to Russia was the accumulation of radiation in fish. 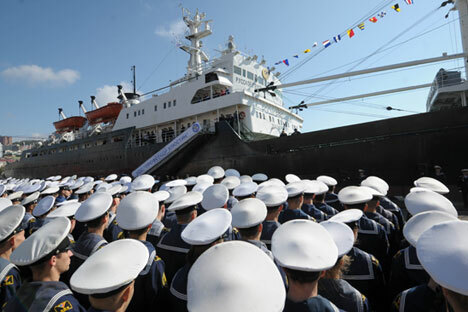 In an interview with RIA Novosti, Stanislav Shabalev, director of the Laboratory of Radiological Monitoring at the Radiev Institute, said that initial tests of marine water and soil from several Kuril islands will take place right on the vessel and the final results will be obtained towards the end of the expedition. He said that this year the tests will be more comprehensive in respect to the past. According to Shabalev, during the new expedition tests will be carried out on atmospheric aerosols. Marine water in all planned locations will be tested for Caesium-137 and Strontium-90, while some water will be tested for plutonium isotopes and some for Tritium. "Moreover, we plan on testing for radionuclides in certain sea organisms, and land and vegetation will be examined on the islands themselves," added Shabalev. Shabalev remarked that the samples that were taken in 2011 and 2012 "showed that everything is pretty much clean, but it is nevertheless necessary to obtain new data." "Despite the proximity of the Russian islands to Japan, after the accident in Fukushima only miniscule amounts of radiation spread to the Kuril Islands," said Sergei Panchenko, a collaborator at the Laboratory of Radioecology of the Institute of Safe Development of Atomic Energy within the Russian Academy of Sciences. The thing is that "the radioactive cloud first drifted over the Pacific Ocean, North America and Europe" and only then came to Russia. According to Panchenko, "the level of radiation from Chernobyl that Japan registered on its territory in 1986 was a thousand times higher than the level of pollution that we registered on the Kuril Islands after Fukushima." The only thing threatening Russia after Fukushima, according to Panchenko, is the accumulation of radiation in various types of commercial fish: "Fukushima's radioactive discharges polluted the sand in the shallows where we find the little sand eels. Sand eels are caught by fishermen and are eaten by bigger commercial fish, which thus accumulate radiation." Gennady Bruk, Director of Internal Exposure Laboratories at the Scientific Research Institute of Radiation Hygiene and participant of the first expedition in 2011, believes that the third expedition will not find high indicators of radioactive pollution. Nevertheless, this does not mean to say that the expeditions should not continue. "After the Chernobyl accident we are still working in infected territories," says Bruk. "And for the population's radioactive security it is very important that this work is continued." Sergei Panchenko shares his opinion: "The radiation situation is not changing and will not change soon. Caesium does not disappear quickly, therefore nature will be completely rebalanced only in 20-30 years."